A couple of years back I had a friend introduce me to a pressure cooker, my life has not been the same since and all the better for it too. It’s a game changer for any home-cook and makes eating healthy fast and simple. According to my smart mouth darling daughter I’m a bit technically challenged but I’ve managed to master the pressure cooker quite well. As long as you can read and follow easy instructions, then it’s really hard to screw up. Today the pressure cooker, outside of my Vitamix, is probably the one appliance in my kitchen that gets a regular workout. So basically I’m telling you if I can do it you can too. Thanks to The Veggie Queen, Jill Nussinow, MS, RDN, it just got a lot easier. Jill is not a rookie at cooking healthy OR using the pressure cooker. 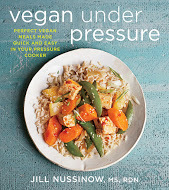 With several books under her belt and a successful blog, Jill has written a very comprehensive guide on how to use and make delicious healthy meals in a flash in, “Vegan Under Pressure”. She walks you through an informative introduction right into a complete how-to-use guide. Her instructions are simple to follow and take the guessing out with some pencil drawings. A lot of times we tend to skip past the cookbook “guide” and instead dive right into the recipes. Take my word for it, you’ll want to spend the extra time reading this part to avoid a possible mishap later. Jill’s years of experience shines through in her recipes proving that anything can be made in the pressure cooker. Her recipes cover everything from making your own spices and sauces to savory main courses to decadent desserts. I like the fact that my time and energy in the kitchen can decrease without sacrificing a delicious and nutritious meal. 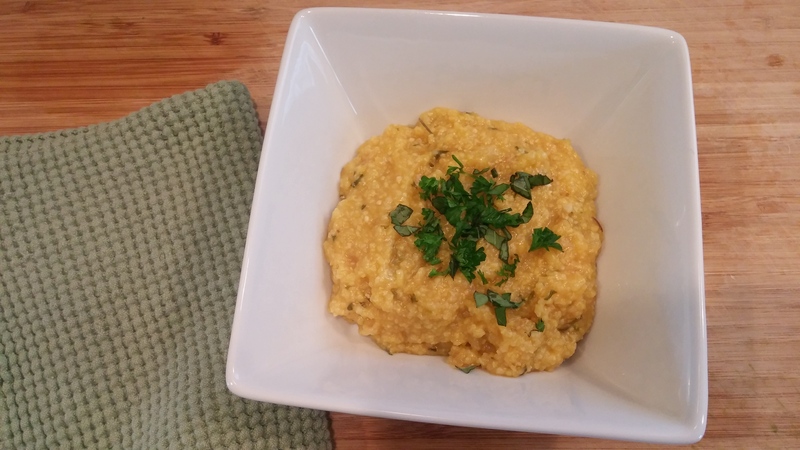 Like this Herbed Polenta that took a mere 5 minutes at high pressure to cook with NO stirring! The best part is no flavor was sacrificed and the texture was just as creamy had I’d been standing over the stove. I love polenta for the fact that it’s cheap, has the potential to take on different flavors, and can be used once cooked many different ways. 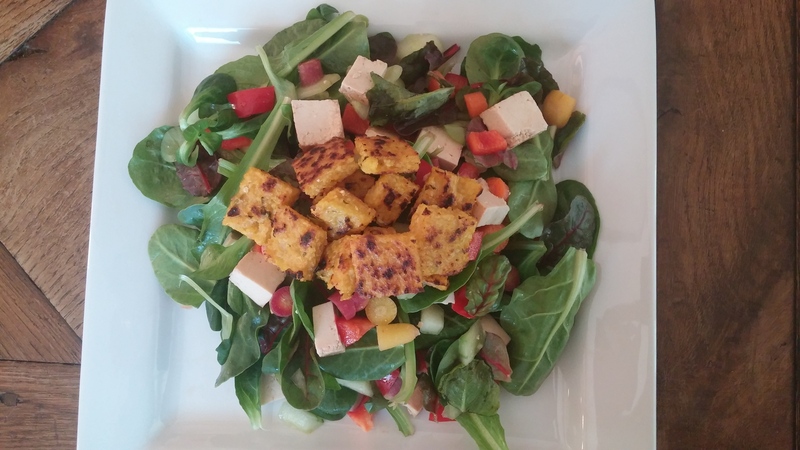 Check out how I took some cooked Herbed Polenta and made it into Polenta Croutons. They make a great salad or soup topper or just pop them in your mouth. That recipe is in the cookbook too. The “Vegan Under Pressure” cookbook will teach you how to get the full potential out of your pressure cooker. Who knows, it might just become the most important appliance in your kitchen too! Time to dust off that pressure cooker cause Jill’s letting me share the savory Herbed Polenta recipe with you! Pressure cooked polenta doesn’t need stirring, which is a real bonus. You might end up with a lump or two but cooking this way saves a lot of time. Adding sundried tomatoes (see variarion below) or dried mushrooms when cooking polenta adds big flavors. Polenta has gone upscale but it’s easy to make at home for pennies. If you can’t stand lumps, you can cook polenta in a dish instead of cooking directly in the pot. You don’t save time but it’s still no-stir. (See “Bowl in Pot” method on page ??) Be sure to get coarse corn grits, also called polenta, rather than corn meal or corn flour which are much finer and will turn your pressure cooker into a fine mess. Ask me how I know. Heat the oil, if using, in the cooker over medium heat. Add the onion and sauté 1 minute. Add garlic and sauté for another minute. Add the water or broth, salt, bay leaf, the oregano, rosemary, half of both the basil and parsley, and stir. Sprinkle the polenta over the water. Do not stir. Lock the lid in place. Bring to high pressure. Cook for 5 minutes. Let the pressure come down naturally, releasing any remaining pressure after 10 minutes has elapsed. If the pressure releases before 10 minutes is up, let the polenta sit in the pot for the full 10 minutes. Remove the lid, tilting it away from you. Remove the bay leaf. Whisk the polenta to smooth out any lumps. If the polenta seems too thin, stir and simmer over medium heat for a few minutes, or lock the lid back on the cooker for 5 minutes and let sit. Serve as is, or pour into glass pans to cool. Once cool, bake, grill or pan fry. Variation: Sundried tomato and olive polenta: add 1/3 cup finely diced sundried tomatoes when cooking the polenta. After the polenta is finished cooking, add 1/4 cup chopped olives, of your choice and stir in.